I spent most of Spring 2014 in Iran, returning to my native country after three long and filled-with-longing decades of absence, and I have not stopped talking about it since! So it’s only inevitable that somehow or other I am giving this ‘show and tell’ talk about a journey that I like to call ‘My Epic Trip to Iran’ – Sunday August 24, 2014, 5 pm at De-Construkt art space in Brooklyn. After 3 decades of self-imposed exile, Azita Houshiar finally returned to her homeland country of Iran, as she had longed to do since the very minute she left it as a 10th grader. It was an epic journey, lasting nearly 3 months, and one that saw her exploring the bazaars, palaces, art galleries, bookstores, beauty salons, museums, mosques, Zoroastrian sacred sites, cemeteries, cafes, restaurants, shops, parks and private homes in Tehran, Isfahan, Yazd, Shiraz, and Kermanshah. She basked in the glow of renewed friendships and familial love, ate lots of delicious food, saw many amazing things, and feasted her eyes as often as she could on the sight of the majestic snow-peaked mountains of Alborz. And she found out whether a hyphenated person can ever really go back ‘home’. 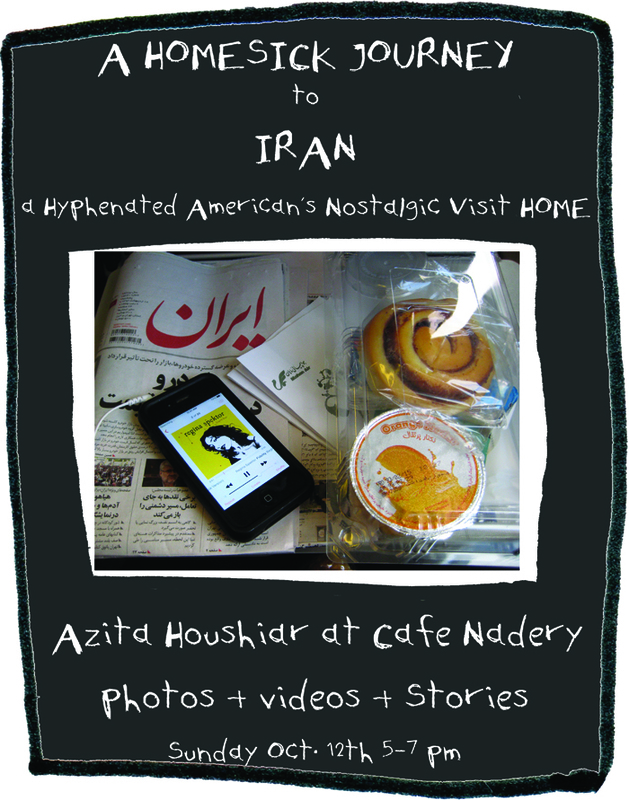 Please join us as Azita gives a NON-POLITICAL talk and shares select photographs, short videos, and stories from her poignant “bittersweet” journey to her homeland and also touches on the concept of ‘exile’ and the issue of ‘identity’ for an Iranian-American straddling that seemingly implausible hyphenated line. Who are Iranians? What is an ordinary Iranian like? What is daily life like in Iran? What do Iranian people do for fun? Do they even ever have fun? Do they go out? Do men and women interact? How do women observe the mandatory hijab? Do women work? Are there any parks in Iran? Can people have pets? What do they watch on TV? Do people go to see plays or to concerts? Is music allowed in public at all? Do they have any movie theatres? Do women drive? Do they even have roads and cars in Iran… don’t they just live in the dessert and ride camels? Is there an art scene? Do they have bookstores? What is identity when straddling that hyphen for hyphenated people? What is exile? Forget about all this, just tell me about the Persian food, what is the food like in Iran? Then come and find out! The hour long event includes a slide show of photographs and video snippets and the stories that go along with it. There will be Persian music and Persian food and sharbat will be served. I don’t get it, if people were for the new regime, why didn’t they just stay there. You voted for a more religious government and are fanatics by definition. Why did you leave your country when you finally got what you wanted? Oh my gosh! You make such an informed, articulate and non prejudicial point. You are a sage commenter by definition. I stand duly chastised. Nicely handled 🙂 “Fanatics by definition.” Sigh. People don’t opt for “regimes,” they try to shake off oppression and live their lives without fear. As an American living through the revolution I can say that because most wanted the Shah’s regime out it didn’t mean they knew exactly what would happen next. It is not all cut and dry, but something had to happen, it could not have stayed the way it was. I will be homesick for Isfahan the rest of my life, as I have been since I left in Feb, 79. My son was able to visit his Fathers family when he was 15, the same age I was when I moved to Iran.. What a fabulous country and people.. (And awesome food!) I am searching this blog because I saw a plate of Badamjoon polo and now I need to find the recipe! I have plenty of Persian cook books But I have found that people from different areas make the same dish many different ways and I like to try them all..
ah, would have LOVED to have seen this. Wish I could have been in the Big Apple for this! Let us know if you ever make it out to Seattle! Oh Azita – I loved this: Do they even have roads and cars in Iran… don’t they just live in the dessert and ride camels? Is there an art scene? Do they have bookstores? If it ever annoys you – remember when I was traveling in the US someone asked me whether we have showers in Switzerland and running water – because they had heard we Europeans are none too clean.. Wonderful that you are sharing your experience with a wider audience at last and bringing humanity to the table .